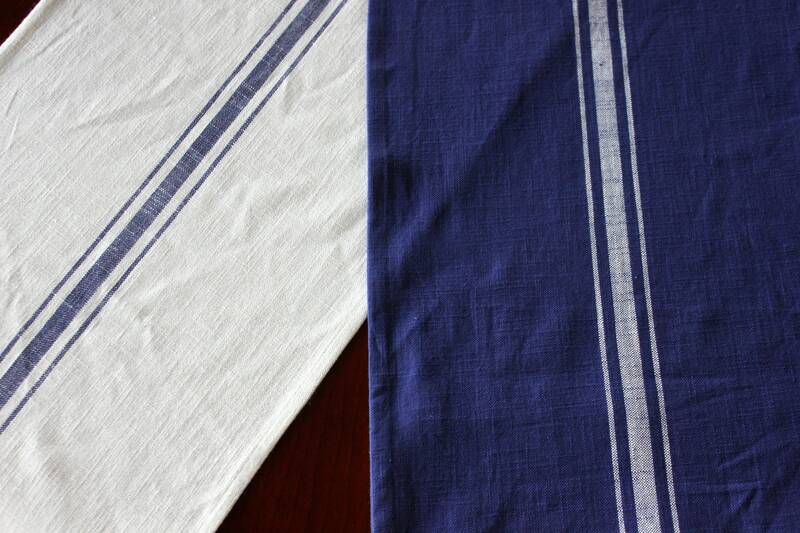 These cotton table runners are so beautiful and charming! Select from a background of cream with woven stripes of blue or blue with white stripes down the center. These table runners are a wonderful addition to your home decor, whether it be cottage decor, farmhouse decor or a modern industrial look! Made from a silky soft and nubby heavier weight 100% cotton. The stripes in this fabric are woven in, not printed or painted on the surface. There are slight nubby imperfections and wrinkles which are the nature of the material. 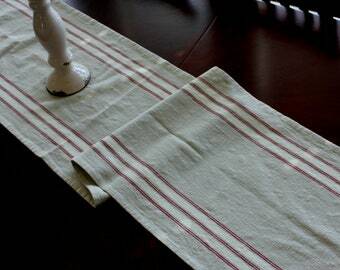 **The width of this table runner is approximately 16" - 17". All materials were washed and dried prior to assembly to minimize shrinkage. Recommended cleaning: wash in cold water, line dry or dry on low in dryer. Remove slightly damp and press with a hot iron and steam. Use a spray starch or sizing for a crisp look. **Please note: If you are matching decor or need a specific color, please contact me for a sample of the material before ordering. I'd be happy to send one to you. Thank you! Happy with my purchase. Exactly what I wanted! Quality fabric, well made and shipped promptly. Thank you. Exactly what I hoped for - love it! Very, very pretty and looks well made. I am very happy with this and would not hesitate to order from this shop again. Care instructions are included with all pillows, table runners, towels and fabric baskets. Please contact me through Etsy regarding custom and personalized orders. Once a custom order is paid, I will not accept cancellations. I appreciate your interest, but I am not currently selling wholesale. Pillows are made approximately 1" smaller than the stated size. Recommended insert size is 2" larger than the cover on pillows that are 18" or more, 1" larger for covers 16", and the same size for cover smaller than 16". Table runners may be 1/2" longer than the length specified. I try to allow this extra because of any additional shrinkage that may occur. Press your runner when you receive it, some materials have more give than others and wrinkle more causing them to shorten. When measuring for your table runner please remember when ordering a ruffled runner, that the total length includes the ruffle. Allow an additional 2" along with the ruffle length, on each end for the ruffle to overhang the edge of the table. -Most orders will be shipped 1st Class USPS with tracking. Tracking information is forward to you when the label is created. ~Priority shipping is available for a small additional fee. You can select priority at checkout. Remember that priority mail is insured up to $50. ~Insurance is available, please contact me for price quote before ordering. ~I will not be responsible for lost packages since insurance is available. -Please allow at least 24 hours for tracking to appear. I use cotton and linen/cotton blend fabrics. I wash and dry all materials before I make my products to remove any chemicals due to processing the fabrics, and to help eliminate material shrinkage. If you follow the cleaning instructions that I enclose, you should have minimal shrinkage. Customers residing in Arizona will be charged sales tax. Please contact me prior to any returns. You must contact me within 7 days of receiving your purchase. All items must be in original condition - new/unused. Any damage will be deducted from your refund. You are responsible for return postage. I will deduct the shipping charges I incurred shipping the item to you, from your refunds. Refunds will be processed within 1 week of receipt of the product back and the postage charges will be deducted at that time.